Just a few days after the Fourth of July, 2005, with her economy crumbling and nationalist feelings at a fever pitch, Japan’s political collapse begins. Two power factions begin to grapple for control of the once powerful ally. American forces are ordered to maintain a high alert on the bases near the regional unrest. Japanese fighters buzz the Abraham Lincoln carrier group in a show of force. The President orders the evacuation of military bases under siege, but not quickly enough for the crack Japanese guerrilla forces--the Sasebo Naval Base is overrun and seized. The State Department and the Pentagon confer and decide the seizure of this installation constitutes a security breach. Much of the equipment at Sasebo is classified. Fearing complete destruction cannot be guaranteed by a missile strike, the Lincoln is ordered to approach and launch an air strike to cover a Marine invasion force. Japanese planners are not unprepared. After the first wave of F-14s leave the deck, French-made land-based Apache cruise missiles begin showing up on the Lincoln’s AMWS. During the air defense, a pair of torpedoes slam into the carrier. After intense action, the task force has lost two DDGs and the Lincoln bears an 8 degree list. The fighters are forced to ditch. US destroyers begin pilot-recovery, intently aware of the presence of Japanese diesel-electric submarines. The task force is withdrawn. Another decision in Washington is enciphered and transmitted by satellite the western Pacific region. Four hundred feet below the surface, a trailing wire antenna gathers the 60 baud signal and sends it to the processors. The USS Holland NSSN-24 makes an abrupt course change and begins to close the coast at maximum silent cruise speed, around 20 knots. Orders dictate the Holland disregard enemy vessels in carrying out her primary objective. She streaks by the enemy submarines undetected. Once within 14 nm of Sasebo, she slows down and soon a detachment of US Navy SEALS in a mini-sub is silently moving toward the shore. The SEALS manage complete surprise and begin recovery of classified materials. Opposition is fierce and the SEALS lose 4 men, but complete their objective. They rendezvous with the Holland successfully. As the submarine begins to transit the launch point, additional orders arrive. The crew prepares for a missile launch. Radar installation, dock repair yards, and naval fuel depots are targeted. In quick succession, twelve Tomahawk TLAMS are launched. The launch is detected by enemy forces. A pair of destroyers flood the area with active sonar. The Holland puts on flank speed and leaves the enemy far behind. Sonar then announces it has an underwater contact, classified as a new Toshiba class Japanese submarine. The captain rubs his chin silently, then orders reduced speed and plots an intercept point. It’s payback time. As the Holland moves into range of the unwitting enemy submarine, bearing, range, and course are determined by the powerful, ultra-modern tracking computers aboard the Holland. Once a final TMA solution is achieved, the captain orders a single MK-48 ADCAP(I) to be fired. Fired is a misnomer. The torpedo swims out of the tube, its pump jet propulsion operating at the lowest setting. As it approaches 4000 yards from the deployment point, the fire control operator orders the weapon to execute a 40 degree turn toward the enemy submarine according to procedure. The torpedo makes its way to the target at 8 knots in near-complete silence. As it closes the final 2000 yards, it is detected by the Toshiba sonar team. The Toshiba immediately dives and increases its speed to emergency flank. The Holland fire control technician enables the torpedo’s homing system and the torpedo springs forward at 60 knots and begins to ping the Toshiba hull. It acquires the Toshiba and seconds later collides into the hull. The Holland is the sole possessor of the depths. The preceding scenario describes the potential capabilities of the successor to the 688 and Seawolf class submarines: the New Attack Submarine, or NSSN. The New Attack Submarine is an advanced stealth, multi-mission, nuclear powered attack submarine for blue ocean anti-submarine warfare and for littoral (shallow or brown water) operation. The NSSN will be quieter than anything the Russians can build, at speeds higher than that of the 688 class, and at costs two-thirds less than a Seawolf class. But although the scenario above takes place in the future, the New Attack Submarine’s toughest battles may be taking place today. Much of the security of the United States lies in the hands of the US Navy submarine force. The original and ultimate stealth weapon, modern American submarines have preserved US naval dominance for more than forty years. The current primary attack submarine is the Los Angeles 688(I) class. The first of the Los Angeles class boats was commissioned in 1976, with sixty-one more planned in the series to follow. For the last 20 years, the Los Angeles class has remained unmatched in stealth capabilities. But three of these submarines have been decommissioned and the rest are scheduled to follow around 2006 at a rate of four a year as they reach the end of their thirty year service life. By 2013, the attack submarine fleet will fall below the level thought to be the minimum consistent with future national security requirements. In the eighties, the Seawolf Attack Submarine was born on the architect’s table, designed to be a superior replacement to the Los Angeles class. It was bigger, faster, had more firepower, more advanced tracking and surveillance gear, and was widely reputed to be "as quiet at cruising speed as a Los Angeles class at the pier." There was a catch, however. After years of testing, tooling up, and construction it became evident that the Seawolf class boats would exceed cost expectations. Indeed, the prohibitive unit cost of approximately $3 billion dollars effectively limited the Seawolf class to a run of three units. As the nineties emerged with the dismantling of the Soviet Empire and the crumbling of the Berlin Wall, many questioned the need for such expensive weapons platforms. The dilemma: how to design and construct a fleet of high-tech attack submarines in numbers sufficient to ensure the security of the country and still not squander the peace dividend. Enter the New Attack Submarine. Seawolf class quieting is being incorporated in a smaller hull while military performance will be maintained or improved. With a focus on the littoral battlespace, the New Attack Submarine will have improved magnetic stealth, sophisticated surveillance capabilities, and Special Warfare enhancements. The New Attack Submarine is being engineered for maximum design flexibility. Its responsiveness to changing missions and threats, and the affordable insertion of new technologies, ensures that it will be a potent warship well into the 21st century. Integrated electronic systems with Commercial-Off-The-Shelf (COTS) components facilitates state-of-the-art technology introduction throughout the life of the class and avoids unit obsolescence. Revoluntionary cost controls have been arranged to build this new class at reasonable prices. 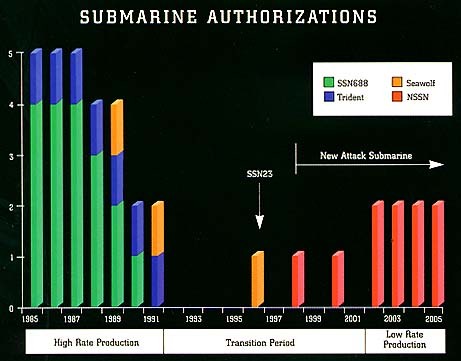 In 1995, Congress directed the Navy to submit a plan which would allocate the first four New Attack Submarines to the Electric Boat Company and the Newport News Shipbuilding on an alternating basis. Electric Boat Corporation and Newport News subsequently announced that they had reached a teaming agreement to cooperatively build the Navy's new class of attack submarines (NSSN). The teaming was later approved in Congress. Based on the demonstrated success of the design/build process, the NSSN design will be far more mature than other submarine designs at the beginning of construction. This greatly reduces the risk of design changes during ship construction -- traditionally, a major cause of cost increases. The nuclear reactor core has been designed to power the submarine throughout its entire operational life without refueling. This will result in a factor of two decrease, compared to previous classes of submarines, in the amount of spent nuclear fuel requiring disposal. Not having to refuel will also result in multi-million dollar cost avoidance for each submarine. Powered by a GE Pressure Water Reactor S9G, 2 turbine engines with one shaft and a pump jet propulser, the NSSN will retain the high speed characteristics of the Seawolf class. The claimed speed is 28 knots dived. Additionally, this powerplant is possibly the quietest of its kind in the world. 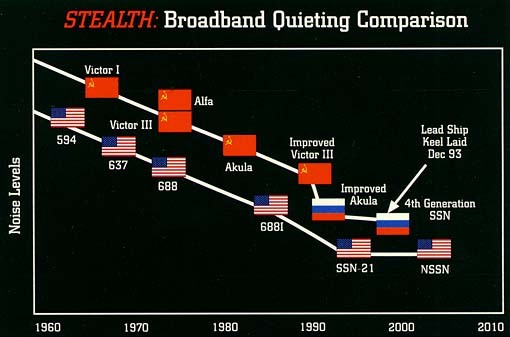 The noise level of the NSSN is equal to that of the Seawolf, with a lower acoustic signature than the Russian Improved Akula class and Russian 4th Generation attack submarines currently under construction. The NSSN will be armed with a variety of weapons; carrying the most advanced heavyweight torpedoes, mines, Tomahawk cruise missiles, and Unmanned Undersea Vehicles (UUVs) for horizontal launch. In addition, Tomahawk missiles will be carried in vertical launch tubes. It also features an integral special lock-in, lock-out chamber for special operations and will host a special operations mini-sub. The NSSN will be the first U.S. submarine built with a visual imaging capability that does not require a mast to penetrate the pressure hull. The sail configuration houses two new photonics masts for improved imaging functions, an improved electronics support measures mast, a HF sonar array, and multi-mission masts that cover the frequency domain for full-spectrum, high data-rate communications. The sail is also designed for future installation of a special mission-configurable mast for enhanced flexibility and combat performance. It's sonar system will include a 15-foot bow array, a HF array in the sail, and a TB-29 thin-line towed array which will improve detection of threats in shallow waters or in areas with high background noise. The plans could also call for a TB-16 towed array, a bow conformal array and/or a wide aperture array. Using modular hull-section design, the boats could be more easily configured for special operations, including the ability to carry 200 troops for covert action , in excess of 100 cruise missiles, or perhaps even the older Trident missiles. The submarine's Command Center will be installed as one single unit resting on cushioned mounting points. The submarine's control suite is equipped with computer touch screens. The submarine's steering and diving control is via a four-button two axis joystick. Advanced design, state-of-the-art technology, multi-faceted operational capability; the New Attack Submarine will continue a proud tradition and ensure America's dominance in the world's oceans. Sources cited: RAND, The Department of Defense, The United States Navy, Jonathan M. Ross, P.E., Electric Boat Corporation, Lockheed Martin, Newport News Shipbuilding, DOT&E, GAO, Jane's Defence Weekly.